Vinyl Digital Exclusive: Limited Deluxe Edition of 1000 Copies! - big DIN A2 poster of legendary Akira Animation Director Koji Morimoto's amazing Artwork. 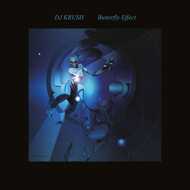 Breaking 11 years of silence, much anticipated album, Butterfly Effect from DJ Krush is about to be released!! There are so many things happening on our planet, both act of God and all the disasters that human beings make. Very little difference in the initial condition affects everything and it becomes a big difference with time and it appears in front of us. Needless to say, it's not all about bad things. The future that DJ Krush and his guest artists visualize, as little things influence each other intricately... their Butterfly Effect is expressed in the new album. DJ Krush sends out the realness to the world with his first album in almost 11 years. Deep sound resonates through dry and empty space! !